« Felix Navidad, prospero Ano Nuevo y Felicidad! Welcome back! 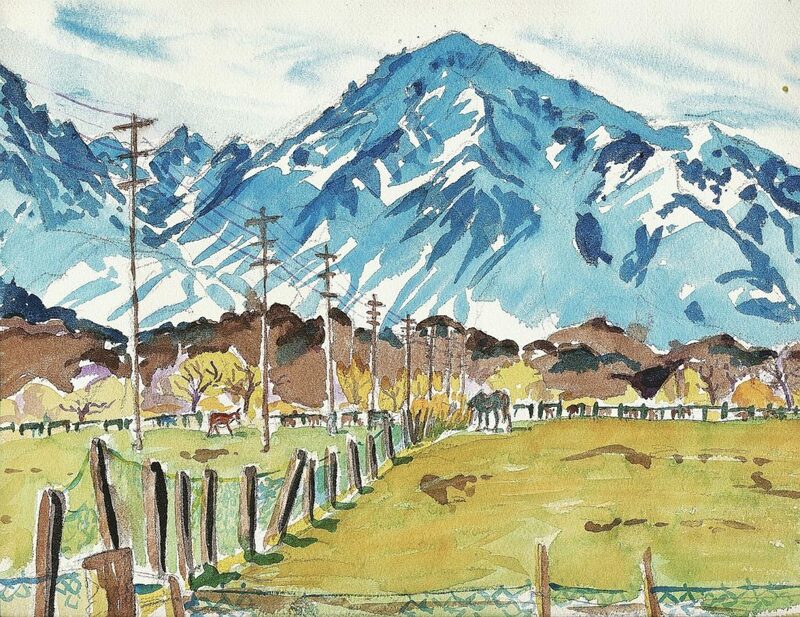 Here’s a watercolor sketch I made in Bishop, Ca. a few years ago. I love the mountains and the horse property around there, the ranges are called the “Whitney Portal”, because the range includes Mount Whitney, which is the highest summit in the continental U.S., at 14, 505 feet. Bishop is just a little bit East of Lone Pine, Ca., home of the Lone Pine Western Film Museum and the Alabama Hills, where Hopalong Cassidy, Death Valley Days, Gene Autry, Roy Rogers and so many old time Western features and TV series were shot. I want to go on a horseback tour of the Alabama Hills some day. Felix helps Danny Dooit play hooky in the strips from 5-22 to 5-28-1933. Danny feels guilty and Felix has a hard time getting him into the spirit of a day of fishing and swimming, then they meet a hobo who wants a “feed”. In the jungle, Felix runs afoul of an elephant, an exotic bird with long legs and an ape, before he wakes up from his dream with the help of the barnyard animals and a pail of water. Here’s Myrtle from 2-21 to 2-27-1949. In the dailies, Sampson sets up a wired telephone network in Myrtle’s house with painful results for Freddie. I like the fantasy in the 2-24, as Bingo the dog “wakes up” Myrtle’s sleeping look-alike doll. The Sunday is a dream fantasy, as the Sun runs a relay race in a Technicolor landscape of Freddie’s imagination. 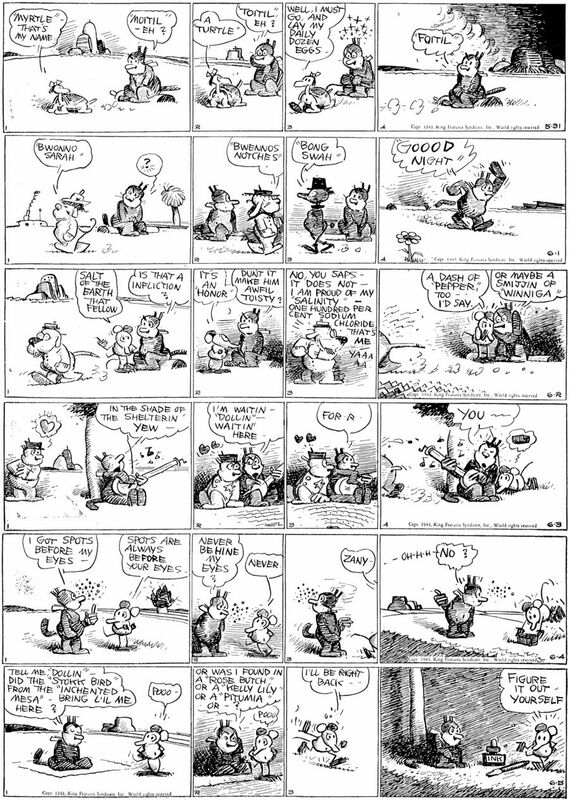 This is one of Dudley Fisher’s best panoramic pages! In answer to reader Daryl Boman’s request, I’m presenting a double dose of Krazy, from 5-21 to 6-12-1943. 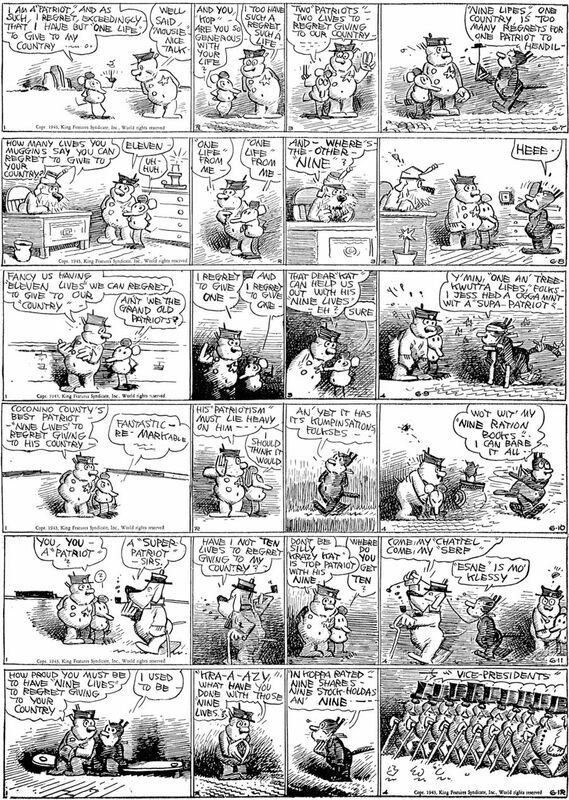 My favorite daily in the first batch is the 6-5, as Krazy tries to figure out where he came from, and Ignatz produces an ink bottle and pen, saying: “Figure It Out Yourself”. Garge does a bit of wartime satire in the 6-7 to 6-12 strips. Especially striking is the 6-9, contributed to the Catblog by Gerd Heinlein, as Krazy loses 8.25 of his lives in a fight with a “Super-Patriot”. Evidently, there were Patriots and Super-Patriots in WW2. If you watch “The Best Years of Our Lives”, directed by William Wyler in 1946, you’ll see a sequence in the drug store where Dana Andrews punches Ray Teal’s character “Mr. Mollett”, so hard that he crashes into a glass display case. The cause of the argument is that Mr. Mollett is skeptical of the reasons that the United States is in the war and it makes Dana Andrews (ex-Navy pilot), mad. This is a little known aspect of the WW2 years that Garge is alluding to here: Ill-will between “Patriots”, who were a bit critical of the politics of the war, and the “Super-Patriots” who were for the war, no matter what. The popular image of WW2, is that after Pearl Harbor, there was little or no criticism of the War’s raison d’etre, but there was a wider range of opinion than that. The whole “One life to give for my country” quotation comes from Nathan Hale, a Revolutionary War soldier and spy. In the 6-11, “Esne” is old English for “Laborer among the lower classes”. I hope this will keep Daryl Boman happy. A milestone has passed, which seems to be little noted in comics fandom, Yoe Books and IDW publishing have just put out Popeye #65, the last in their series reprinting ALL of Dell’s regularly numbered Popeye comics from the 1940s to 1962. After that, Gold Key started publishing Popeye in Giant editions. I happen to like Bud Sagendorf’s cartooning and his approach to Popeye, Olive, Wimpy, Swee’pea and cast is second-best to the Elzie Segar strips of the 1920s and 1930s. The adventure in the almost book-length stories of the first 10 52 page issues are especially exciting and funny. Yoe Books is also issuing the series in hard-cover book collections. It’s kind of sobering that I was the only person still buying the series at my local comic book store here in Glendale toward the end. My store, Legacy Comics, kept ordering the issues for me, since subscriptions were not available. Yoe Books should really be commended for this accomplishment, as they carried on with Popeye, despite low sales. Comic Books have swung over to a “traced from photographs” look in the artwork. There is very little good cartooning left in “funny books”. So again, a tip of the sailor hat to Yoe Books for hitting 65 issues of “Popeye”. Maybe another publisher will take a chance on the earlier “Four Color” Popeye books some of these evenings. Now let’s all stroll over to the gym and watch the fat men play handball! This entry was posted on Wednesday, January 31st, 2018 at 6:32 pm and is filed under Uncategorized. You can follow any responses to this entry through the RSS 2.0 feed. You can leave a response, or trackback from your own site. Double dose of Krazy… Yay! Sad to think that Herriman had less than one year to live by this time (mid-1943), but his intellect was obviously still very intact when he made these strips. The Yoe “Popeye” reprints are a fun read whenever I come across it. I love how they got different artists to draw Popeye in their own style (those may be variants, I think?). I have one by Rich Powell that I like. Hi Charles, Thanks for your comment, glad you like my watercolor. 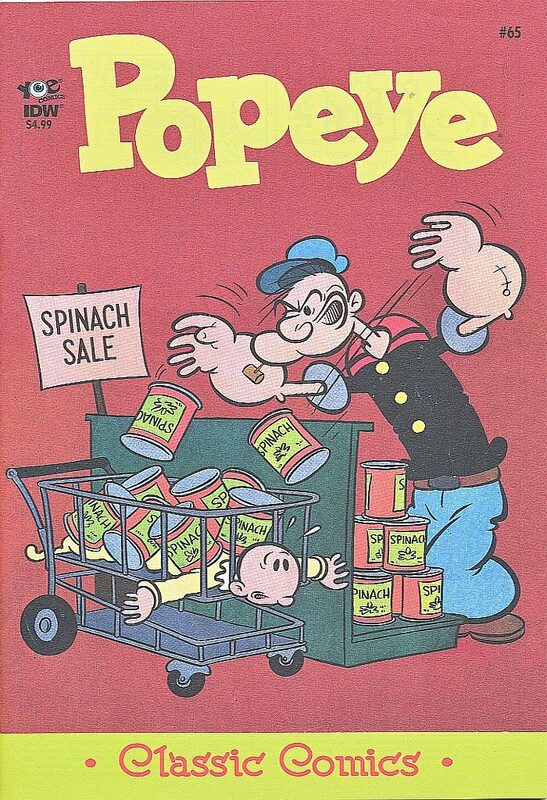 The Popeye reprints that I was reviewing were the old Bud Sagendorf Dell titles. The Popeye books that you are referring to were published in 2012 and were the work of Roger Langridge Tom Kelly, Bruce Ozella and other Popeye cartoonists. Number 12 features a story with both Barney Google AND Popeye in it. They were fun to read, but the book only lasted 12 issues, with variant covers for each number. Beautiful painting , Mark ! Thanks Dave! I with I could be in Bishop real soon.